There aren't many Thai places we love in the suburbs, so when I'm craving Thai food, I find myself making it at home. 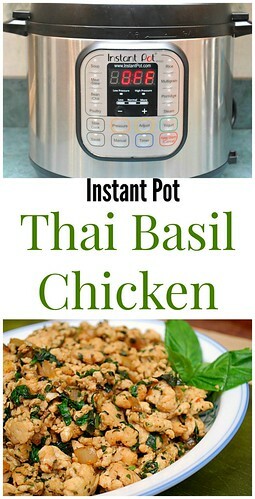 I recently prepared this Thai Basil Chicken for my family and loved how quickly it came together. Thai cuisine has such a freshness about it that I really enjoy. The use of fresh herbs such as basil and mint really lend a vibrant, bright flavor in Thai dishes. Basil is one heavily used herb in this dish and even though there's 2 cups of basil, it doesn't overpower the dish as much as you'd think. The dish starts out by processing 1 cup of fresh basil (or fresh Thai basil) with garlic cloves and chili garlic sauce. I chose to use chili garlic sauce since I didn't want the dish to be spicy at all. Using only 1/2 teaspoon of the chili garlic sauce gave just a subtle heat which was perfect for me. If you like the spice and heat of Thai cuisine, feel free to add more chili garlic sauce or use Thai or serrano peppers instead. A tablespoon of this basil/garlic mixture is placed in the Instant Pot while the remaining mixture is set aside to use later. Next, the ground chicken is mixed with a little fish sauce and chilled for a few minutes before sauteeing with the basil/garlic mixture. The chicken then is pressure cooked and the basil/garlic mixture that was previously set aside is added to the Instant Pot to flavor the chicken. Just before serving, more fresh basil is added and allowed to wilt. Then, it's ready to serve! We liked this over steamed jasmine rice or you can serve this in lettuce cups! Place garlic, 1 cup fresh basil leaves and the chili garlic sauce in a food processor. Pulse until finely chopped, scraping bowl one time. Transfer mixture to a small bowl with the 1 tablespoon fish sauce, oyster sauce, soy sauce, sugar, and vinegar. Transfer to IP. Press SAUTE on the IP and add oil to basil garlic mixture; Saute and allow herbs and onion to soften. 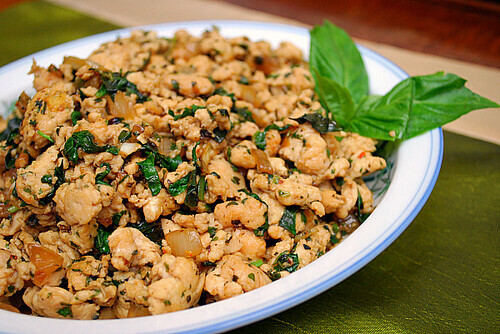 Once onion is softened, add the chilled ground chicken, and stirring constantly, break chicken up as it cooks. Continue stirring until chicken is no longer pink. When the IP has beeped after pressure cooking for 3 minutes, turn the setting on top of your IP to VENTING. Doing so allows the IP to quickly release any remaining pressure (also known as QPR or QR). I use a wooden spoon to carefully turn the setting to avoid close contact with the potential steam. You may also want to turn your IP away from cabinets to allow the released steam to escape freely. The pin at the top of your IP will drop when all pressure has been released and it's safe to open. Meanwhile, chiffonade the remaining cup of basil leaves and add to the IP to cook 1 additional minute or so, until the basil wilts. Serve over rice.